Detailed on the Google+ profile page of Google associate product manager Sean Liu, the company has swapped out the +1 button within the Google search results page with a new Google+ share link. 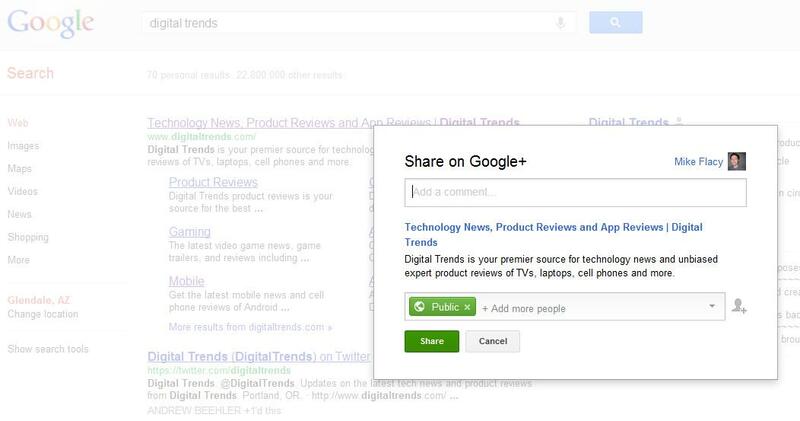 Appearing when the user hovers the mouse cursor over a search listing, clicking the share link will now launch the standard Google+ share overlay window. This new window allows the Google+ user to add a comment that describes the link as well as choose specific circles of Google+ friends before publishing the content in their feed. Liu didn’t specify how aggressively the search company is rolling out the new sharing link in countries around the world, but the link is already appearing within the United States as well as the United Kingdom for searches in English. 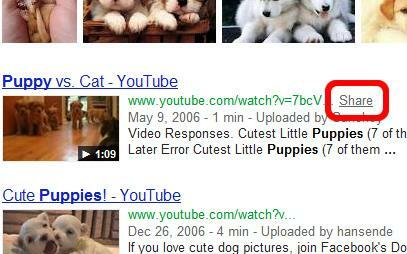 However, Google doesn’t appear to be highlighting the share link extremely prominently within search listings. Unless the user hovers over the link, they won’t know that the share link even exists. In addition, the light gray text of the share link blends into the rest of the search result. Compared to the visually noticeable +1 button, this seems like a step backwards in terms of design. In addition, Google+ users commenting on Liu’s post are lamenting the fact that Google has replaced the +1 button with the share link instead of including both on the search listing. However, it’s highly possible that people unfamiliar with Google+ simply wouldn’t understand the difference between the two actions. While sharing is specific to the content stream of a Google+ profile, the +1 button more of a recommendation tool between friends. With the launch of the new sharing link on the search engine results page, it’s obvious that the company is attempting to increase the amount of content shared on the social network as well as the amount of time users spend making comments and browsing through other Google+ profile pages. While 2012 comScore data pointed out that Google+ users only spend an average of three minutes on the social network each month, Facebook users are spending several hours browsing that site each month. Arguably, the Google+ share link is a huge advantage over a site like Facebook and could spur vastly more activity on Google’s social network if the link becomes popular. 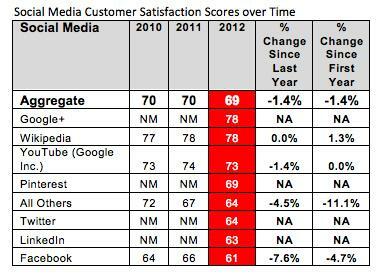 In a related study published this week by the American Customer Satisfaction Index, the overall satisfaction level of a Google+ user was found to be much higher than a typical Facebook user. In fact, Google+ scored high on the satisfaction index due to the limited amount of advertising on the social network in addition to strong mobile support on smartphones and tablets. Alternatively, Facebook was at the bottom of the list due to privacy issues and an annoying amount of advertising in many areas around the social network. In addition, Facebook users are upset about the volume of changes that Facebook has been rolling out over the past twelve months including the new Timeline design for user and brand profile pages. Other sites that scored high on the list include Wikipedia, YouTube and Pinterest while Twitter and LinkedIn brought up the rear with Facebook.